There are literally thousands of comic book super-heroes representing dozens of real-world religions. But amongst the numerous Catholic super-heroes, Jewish super-heroes, Buddhist super-heroes, atheist super-heroes, etc., who are the greatest representatives of their faith groups? For the purposes of this page, what do we mean by "greatest"? It is a combination of things. First of all, if at all possible, a character should be an overt, recognized adherent of a specific religious group. The more solidly a character has been established as a member of their religious group, the better. Also, the better a character represents his or her faith and its values, the more likely it is that they will be picked as the "greatest" super-hero representing that group. This trumps the character's raw strength and power, which is not a very important factor in our consideration. No mortal is perfect, not even super-heroes, so don't expect any super-hero to be a 100% perfect representative of the beliefs and ethical values of their religious group. Even characters who are quite imperfect in the degree to which they follow the teachings of their religion might be the "greatest" super-hero from their religion, all things considered. The more widely known a character is, the better. Some obscure characters are created to be perfect examples or satirically idealistic members of various groups, but they are essentially one-note or single-story characters. Such characters will be passed over in favor of better known, established characters that most comic book fans have actually heard of. Finally, a super-hero should be heroic. The character should possess elements of greatness beyond simply following the tenets of their faith. So, with these parameters in mind, who are the greatest super-heroes of various faiths? This one's easy. The truth is, there aren't very many identifiably Methodist super-heroes, but when you've got the Big Red S on your side, how many do you need? Superman is genuinely "great" and genuinely "Methodist." According to published DC Comics lore, Clark Kent attended a Methodist church every week with his mother (Martha Kent) until he was 14-years-old. He stopped attending regular worship services when his super-hearing kicked in, but even into adulthood Clark sometimes seeks counsel from Christian clergy, including the pastor of his home church in Smallville, Kansas. Among super-heroes, they don't come much "greater" than Superman. 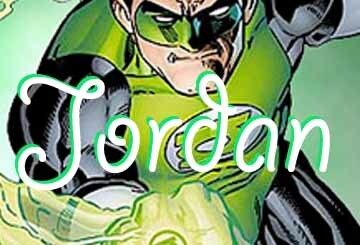 Not only is he the original archetypal "super-hero" of the type which has become so commonly copied, he is regarded by the public on DC Earth as inarguably the world's greatest super-hero. He is the standard that other super-heroes try to measure up to. Superman is the most powerful active, well known super-hero and also remains one of the "greatest" super-heroes ever in terms of his moral example. Superman knows how much people look up to him and he knows he represents all the people of Earth, so he doesn't make a big deal about his religious background in public. It's a fairly sensible, Methodist approach to take. Runners-Up: Superman doesn't have much competition for the title of "greatest Methodist super-hero." 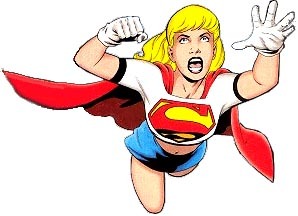 The closest contender would be one version of Supergirl: Linda Danvers. Some better known versions of Supergirl have not been Methodist at all, but during the 1990s DC re-created Supergirl in a whole new way. She was no longer the Kryptonian-raised cousin of Superman, but was an "Earth-born angel" in a series with heavy doses of religious content, written by Jewish writer Peter David. Linda Danvers was a member of the Leesburg United Methodist Church, where her mother was a long-time, active congregant. A supporting character in the series was Supergirl's pastor: Rev. Larry Varvel, a character based on a real-life United Methodist minister of the same name. This version of Supergirl was more overtly Methodist than Superman is, but her relatively temporary status relegates her to runner-up status. With well over 100 Jewish super-heroes to choose from, the choice of "greatest Jewish superhero" is a difficult one. But for our money, Aunt Petunia's irascible nephew Benjamin J. Grimm earns the title. 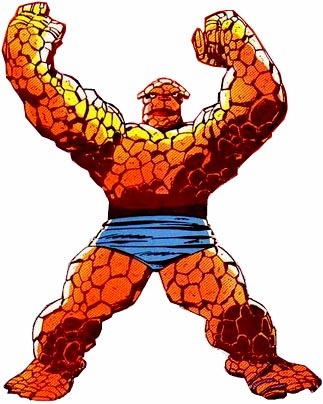 Better known as "The Thing," this orange rock-covered hero was a founding member of the Fantastic Four. The introduction of the Fantastic Four began the Marvel Age of comics in 1961 and has influenced super-heros and comics since. The Thing is known throughout the world as one of the most experienced, toughest, and reliable super-heroes in history. And yet, until just a few years ago, Ben Grimm would not have been a contender for the "greatest Jewish super-hero" title. He was always a great super-hero, but few people knew he was Jewish. Ben Grimm never mentioned his religious background because he feared that his monstrous appearance (the result of the cosmic ray-based accident that created the Fantastic Four) would reflect poorly on his fellow Jews. In many ways a fictional alter ego for the great Jewish comic book artist Jack Kirby (his co-creator), the Thing was probably always regarded by his writers as Jewish. But only recently has The Thing become comfortable enough to talk about his Jewishness on-panel. In a recent issue of his own series, the Thing even had a belated bar mitzvah to which he invited friends from both his local synagogue as well as the non-Jewish super-hero community. So, with his uncontested status as one of the greatest super-heroes in the world, as well as his recent re-connection with Jewish religious life and his Jewish identity, we regard the Thing as the "greatest Jewish super-hero." Runners-Up: There are many close contenders for this title! Certainly Shadowcat, one of the greatest, most popular X-Men ever and one of the first significant openly Jewish super-heroes, should be mentioned. Doc Sampson, a long-time Hulk supporting character, acts as a psychologist to the super-hero community more often than he acts as an active super-hero himself, but his gamma-born super strength makes him one tough customer. He seems to be more religiously observant than Shadowcat. The strong Jewish identity of Israeli national hero Sabra has always been evident. Colossal Boy of the Legion of Super-Heroes, Ultraverse hero Prime, former New Warrior Justice (now an Initiative teacher at Camp Hammond), Songbird of the Thunderbolts, and Smasher/Nuklon (Al Rothstein) of Infinity, Inc. are all admirable Jewish super-heroes who could be mentioned as well. There really are too many Jewish super-heroes to mention here, many of which are quite great in their own right, although few are as well known as The Thing. A number of characters are clearly "more Jewish" in terms of active religious observance than the Thing. Among these are the DC Comics heroes Ragman (of Shadowpact) and Ramban (of Hayoth), who are actually Jewish rabbis. Seraph (Chaim Lavon) is Jewish member of DC's Global Guardians who even gets his power directly from G_d. But these characters are nowhere near as well known by the real-world public or their fictional public as Ben Grimm. Kitty Pride SHOULD have won this one hands down. SHE has been an OPENLY Jewish character all along. Ben was RETCONNED to be Jewish because it suited the writers/publishers AT THE TIME. The title of "greatest Catholic super-hero" is also a highly contested one, and there may be some disagreement with our choice. But, Kurt Wagner, the blue-skinned mutant member of the X-Men known as Nightcrawler would certainly be at the top or near the top of most everybody's list. Nightcrawler has become one of the best-known overtly Catholic comic book characters ever. When the religious affiliation of super-heroes is discussed, Nightcrawler is usually one of the first characters mentioned. His devout Catholicism was even on display in the second X-Men movie: X2 (2003) (i.e,. "X-Men United"). In published comics, Nightcrawler spent a long time training to become a priest. Depending on how one reads the applicable tales, he actually did become a Catholic priest or only seemingly became a priest. Numerous stories show him wearing a Catholic priest's collar. Nightcrawler was raised in Germany by a Gypsy circus family. His adoptive mother was a Roma sorceress and his biological mother was the villainous and decidedly non-religious mutant named Mystique. Nightcrawler appears to actually be a convert to Catholicism, or at least somebody raised with little connection to the church who embraced it as an adult. In any case, Nightcrawler's Catholic faith is entirely of his own choosing: it has nothing to do with his powers or family or culture. The always-likable, ever-hopeful "fuzzy elf" is famous for his many deep religious discussions with more "skeptical" characters such as his teammate, Wolverine. 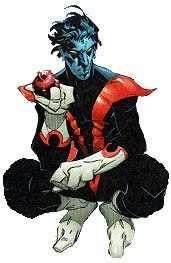 Nightcrawler has also emerged as a leader among the mutant super-hero community, having led the British team Excalibur as well as various squads of X-Men. Nightcrawler is not be a perfect example of Catholic faith and ethical teachings, but he is probably one of the best examples of fictional Catholics that you can find in popular fiction. Runners-Up: There are far too many Catholic super-heroes to mention in passing here, many of which are quite well known and/or quite devout. DC's Blue Devil (who has had his own series and now stars in Shadowpact) is a particularly faithful Catholic superhero. Bonita Juarez, the Avenger and Ranger known as Firebird is also particularly devout. Batman's ally the Huntress, with her love/hate relationship to the Catholic Church could also be mentioned. Some Catholic super-heroes (such as Batman and the Hulk are considerably more famous than these, but they're very poor examples of Catholics, and their Catholic religious affiliation is less widely known. 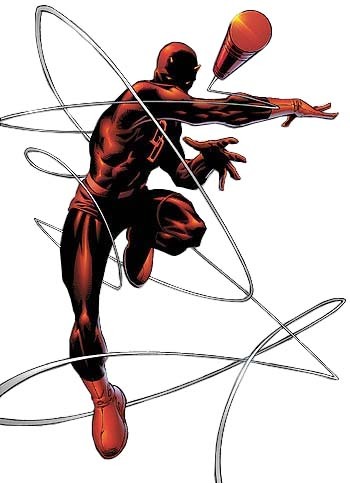 Perhaps the top runner-up is Matt Murdock, the blind hero of Hell's Kitchen known as Daredevil. Murdock is well known, he has starred in his own series almost non-stop since the founding years of Marvel, and he has been portrayed on the big screen. It is arguable whether Daredevil is as well known as Nightcrawler has become. Although the character has been around longer, Nightcrawler has been featured as a regular character in various X-Men animated series, something that can't be said about Daredevil. And the X-Men are certainly one of the world's best-known and top-selling comic book teams. Murdock is also famously Catholic. We have seen him in confession and church. His mother even became a Catholic nun! What tips the scale in Nightcrawler's favor is his adherence to Catholic teachings. Matt Murdock may have a strong Catholic identity and Catholicism has sometimes been central to stories about him, but he's often a really bad Catholic! Daredevil is a stalwart super-hero, but Catholic teachings about sexual morality seem to have largely been lost on him. He can also be brutally violent in ways that Nightcrawler never approaches. Nightcrawler isn't portrayed as an angelic "choir boy" (we're not sure what goes on behind closed doors between him and Amanda Sefton), but he is consistently and intentionally portrayed as a devout Catholic, while Daredevil is consistently portrayed as a Catholic who is less than devout. There are dozens of Muslim super-heroes to choose from, but one stands out for being both consistently prominent as well as for maintaining unflagging devotion to God, her religion, and strong ethical standards: Sooraya Qadir, the young mutant known as "Dust." Unlike many Muslim super-heroes, Dust was not a one-short character who appeared in one Middle Eastern-themed story or appeared only sporadically. After being introduced in the pages of the X-Men, Dust soon became a recurring character and then a star of New Mutants (volume 2) and New X-Men. In 2008 New X-Men was cancelled and replaced with Young X-Men. Dust was one of the only characters to remain through the transition. Dust is immediately recognizable as a Muslim: She is almost always seen wearing her burqua. She lives in America and is surrounded by non-Muslim, Western people, friends, colleagues, and values. But she has never capitulated and given up her Muslim values and beliefs, despite the fact that there is no social pressure whatsoever to retain them. 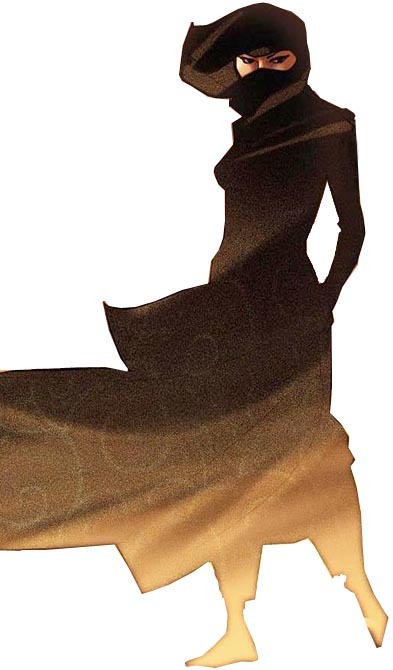 Dust is one of the characters that people think of first when considering Muslim super-heroes or religious super-heroes in general. She well represents Islam specifically and devotion to God generally. This gentle but powerful mutant heroine is our pick as the greatest Muslim super-hero. Runners-Up: As Islam is the second-largest religion in the world, it is not surprising that there is a long history of Muslim comic book characters. Muslims have usually been portrayed as villains in comics and other Western genre fare, but there are still dozens of Muslim heroes, including many bona fide costumed super-heroes. Arabian Knight (Abdul Qamar) was long one of Marvel's better known Muslim super-heroes, although he was somewhat stereotypical as a Bedouin who rode a magic carpet, and he never appeared regularly in any series. The Authority had The Doctor (Habib Ben Hassan), who had been a suicide bomber. Less stereotypical was Marvel character Josiah al hajj Saddiq, known as Justice and later as Josiah X. He is a black Muslim clergyman, so his affiliation as a Muslim is unquestionable, but he has enjoyed relatively few appearances, despite starring in the short-lived title The Crew. Other somewhat "obvious" Muslim characters include various versions of Sinbad and other stock Arab/Muslim characters. Among the best-established Muslim superheroes in DC comics is Selma Tolon, the superheroine known as Janissary. Despite having been a member of the Justice League, Janissary remains relatively unknown. Another recurring DC Comics Muslim was Naif al-Sheikh, the non-powered liaison for the short-lived Justice League Elite. The Indonesian super-heroine Cascade (Sujatmi Sunowaparti) of the Global Guardians also remains relatively unknown. 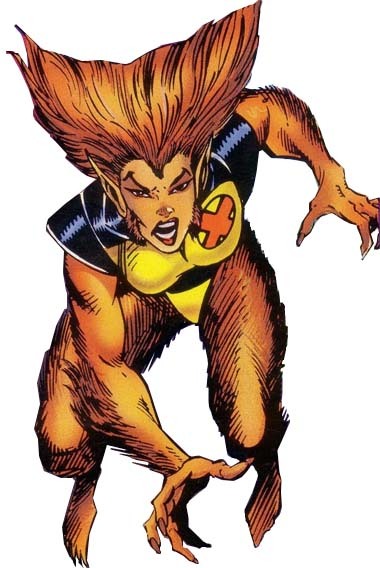 This one is easy: The world's greatest Presbyterian super-hero is Rahne Sinclair, the founding member of the New Mutants known as "Wolfsbane." Rahne's Presbyterian faith has been at the core of her character since she first appeared in Marvel Graphic Novel #4, which introduced the New Mutants - a new generation of mutants who trained with X-Men founder Charles Xavier. Rahne was even raised by a Presbyterian minister: Reverend Craig. (He is probably her biological father, although I'm not sure he has acknowledged this.) When asked about her religion, Rahne has been quick to answer: "Scots Presbyterian." She has been identified as Presbyterian in the New Mutants letters column. This is one of the most widely known facts about the character, aside from the facts that she is Scottish and a mutant werewolf. Wolfsbane didn't just start out Presbyterian. She has remained that way. Despite that fact that Reverend Craig has, at times, been portrayed as something of an ogre, Rahne maintains a strong, sincere faith. Even after growing up considerably and making a life for herself outside of her family and the New Mutants, she has been portrayed as a weekly churchgoer. She is often seen wearing a Christian cross necklace. Wolfsbane is one of the most openly, devoutly Christian characters among Marvel's super-hero community. Runners-Up: There isn't much competition. Presbyterian super-heroes are few and far between. Robbie Baldwin once identified himself as Presbyterian. 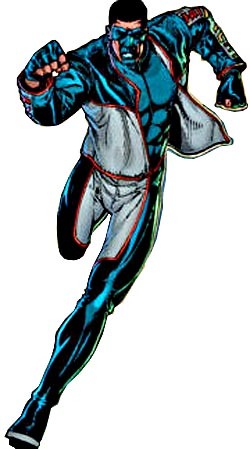 (Baldwin was the New Warrior known as Speedball, who became the creepy member of the Thunderbolts known as Penance after the actions of his team triggered Marvel's Civil War.) But other than a one-panel identification, we've never really seen Baldwin door say much about his religious affiliation. One can make a case for his masochistic Penance armor having roots in his Calvinistic background, but that's a whole other story. Other than that, there's not much to even consider. George Mullaney was a Presbyterian supporting character in DP7, the best-written series in Marvel's New Universe line. Mullaney was known as "Mutator" and "Wild Thing," but he was mostly a "bad guy" (more misguided than evil), and he was officially identified as a "non-practicing" Presbyterian. So Wolfsbane has little competition to worry about. 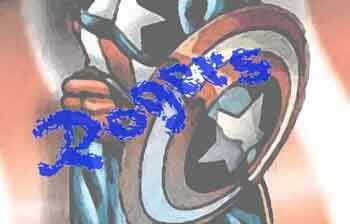 Practically everybody has doubts or questions about their beliefs from time to time, and super-heroes are no exception. But while anti-religious and openly atheistic super-villains are innumerable, relatively few super-heroes are identifiably atheists. The greatest atheist super-hero is Wendell Elvis Vaughn, better known as Quasar. Quasar (who was originally known as "Marvel Boy") is a great atheist super-hero for a number of reasons. 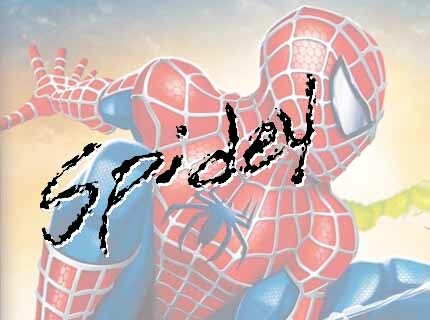 For one thing, he was one of the greatest and most powerful super-heroes in the Marvel Universe. With his quantum bands and later possession of the Star Brand, Quasar was easily one of Earth's mightiest heroes, and a welcome addition to the Avengers. But he later took on a far more cosmic status when he was appointed "Protector of the Universe." 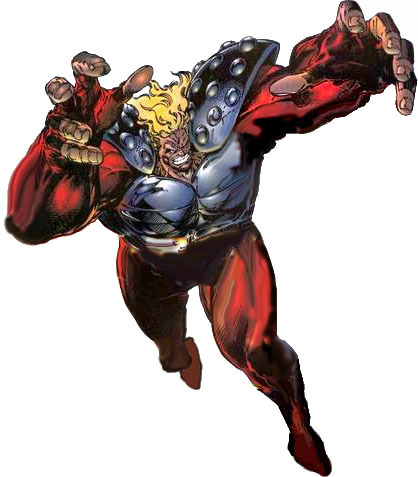 Quasar may not be particularly well known by the non-comic book reading public, but he had a long, respectable history as a significant Marvel comic book character and he was fairly well known by the public and the super-human community of his Earth. Another reason that Quasar is our pick as the "greatest atheist super-hero" is that he really was truly and completely an atheist, not simply a hero with another belief system or religious upbringing who sometimes vacillates in his beliefs. Quasar's father was an atheist. Quasar was raised as an atheist, and he remained an atheist as an adult, even in the face of cosmic-level experiences that have caused other ostensibly atheist characters to doubt their beliefs (or "disbelief," as it were). Even when Quasar's deceased father seemingly visited him from the beyond the grave (Quasar #22) neither Quasar nor his father wavered in their staunch atheism. 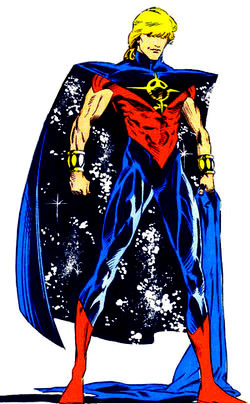 Finally, we pick Quasar as the "greatest Atheist super-hero" because of his great nobility and moral center. 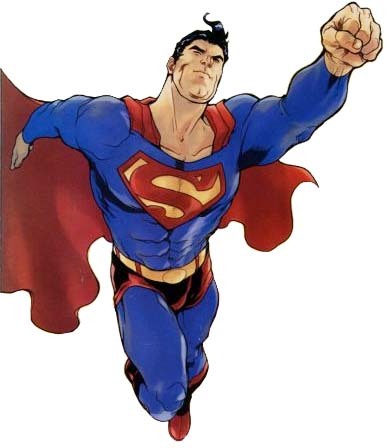 Many other super-heroes who are portrayed as atheists or part-time atheists embody stereotypical behaviors and personality traits often attributed to atheists in literature and popular culture: They are psychologically maladjusted, pathologically violent, intolerant, haughty, rebellious against all moral authority, or angry at God over the death of loved ones. Quasar is none of these things. Other than his upbringing and choosing to retain the beliefs his father taught him, nothing "turned" him into an atheist. There is no tragic event which caused him to "lose his faith." And Quasar's atheism does not equate to lack of morality, as it does with many comic book characters. In fact, Quasar was one of the most morally upstanding super-heroes around. Runners-Up: Some atheist super-heroes are better known than Quasar, but we didn't pick them as the "greatest atheist superhero" because they don't match Quasar in the criteria we used. Least important is the fact that none of them are as powerful as Quasar. More important is the fact that they aren't as solidly atheistic as Quasar, and they are nowhere near as admirable as role models. Two characters worth mentioning here that many atheist comic book readers have gravitated toward are Wolverine and Batman. The biggest problem in regarding these characters as "great atheist" superheroes is that they're really not very good atheists. For every instance in which Wolverine has expressed atheism or identified himself as an atheist, we can find two or three examples of him doing something decidedly non-atheist: Wolverine was raised in a devoutly Christian home; as a child he had strong religious belief. As an adult, Wolverine has prayed to God (sometimes with great sincerity and fervency); Wolverine has sought out guidance from religious representatives. Wolverine has been shown engaging in Buddhist and Shinto and Native American religious practices. Multiple stories (in comics and animation) have even centered around a skeptical or atheistic Wolverine having a conversion experience that melts his heart and brings him to faith. Wolverine has even died and been to the afterlife and had overtly spiritual experiences which are less than conducive to atheistic thinking. In his religious outlook, Wolverine is often skeptical and cynical, but these traits are often used as plot points in stories about him changing as a character, sometimes overcoming such positions. So while it is understandable that many atheist readers embrace the character, Wolverine is hardly the purest example of atheistic thinking or belief. Furthermore, as much as we enjoy the character, Wolverine must be regarded as a horrible role model. He has killed literally hundreds of people. Wolverine actively dissuades other heroes from going down the path he took. Even if one can make a claim that most of the people who died at Wolverine's hands (or claws) probably deserved it, this isn't the best character to represent atheists, who already most contend with criticism from non-atheists over Stalin and Mao and Pol Pot and other atheists whose efforts to fight for the greater good (as they saw it) could be compared to Wolverine's brand of justice. Batman is far less violent and deadly than Wolverine. His personal code of ethics against killing is generally admirable, although he has been criticized for allowing villains such as the Joker to live and kill hundreds of further victims. Batman can be a wonderful character to read about, but many of his readers as well as his peers think he would be a terrible person to emulate. He can seem like an irredeemably obsessive, miserable S.O.B. Despite all his protestations about doing what is necessary, the truth remains that largely due to his dark influence, Gotham City is something of a hell hole, while other cities with famous superhero protectors (Metropolis, Central City, Star City, etc.) are relatively cheerful, bright, vibrant places. And we're not even considering the deadly dangers Batman is personally responsible for due to his OMAC shenanigans and other Machiavellian, distrustful, self-appointed schemes. Aside from questions about his nobility and effectiveness as a hero, Batman simply isn't much of an atheist. He is definitely skeptical and definitely suspicious of non-materialism. But classifying him simply as an "atheist" is inaccurate, or at least grossly simplistic. For every example of Batman doing or saying something identifiably atheistic (as opposed to simply skeptical), there are probably 9 or 10 examples of him doing something overtly religious or non-atheistic. Batman's Episcopalian/Catholic childhood upbringing is well established. Published origin stories have on multiple occasions recalled how young Bruce Wayne prayed every night after his parents were murdered. Prior to starting his costumed career, Bruce Wayne trained in Buddhist monasteries. As an adult, he has periodically gone back to Eastern religious and mystic sources for inspiration and rejuvenation. As an adult hero, Catholic/Episcopalian themes and imagery haunt the corners of Batman's life more frequently than nearly any major hero, perhaps owing to the gothic feel of the character. As an adult, we have seen Batman/Bruce Wayne pray, express religious belief, and take part in religious ceremony many times. On the other hand, we know of only one published instance in which Batman identified himself as "atheistic," and this line itself could be considered something of a joke. There is no question that Batman is highly skeptical. He does not attend church regularly. In his behavior, Batman clearly rejects many normative Christian ethical practices - notably regarding forgiveness, vengeance, violence, and sexual morality. So is Batman an atheist? Yes, sometimes. But "sometimes" isn't enough to elevate Batman to rank of "greatest atheist superhero," especially given his questionable psychological health and his equivocal status as as a role model. Most atheists would rather not see atheism regarded as "a belief system children turn to because their parents were murdered." Mr. Terrific might be the closest runner-up to Quasar in the "greatest atheist superhero" race. Mr. Terrific is, in fact, often the superhero that comic book readers think of first when they name atheist superheroes. Mr. Terrific is a stalwart atheist, but we did not rank him the "greatest" representative of atheism largely because but he turned to atheism only after his family was killed. Mr. Terrific experienced doubts about his atheism, but he eventually maintained his position (some people would say illogically) even after being visited by them from the afterlife. Mr. Terrific is far better adjusted psychologically than Batman is and he displays strong moral, ethical standards (far more than self-recriminating, ultra-violent Wolverine). Mr. Terrific is an important character in the DC Universe. But aside from his great intelligence, his only real "super-power" is that he is invisible to soulless technology. (Interestingly enough, robots with souls can see Mr. Terrific, but robots without souls can not, a fact which, in and of itself, should undermine his own beliefs if he thought about it). So, because of Mr. Terrific's doubts and the fact that he isn't a life-long atheist, as well as his relative lack of power, we have given Quasar the nod, but assert that Mr. Terrific is a strong runner-up. Atheism is not a religion... if it is, then NOT collecting stamps is a "hobby" and baldness is a hair color. One of the fringe objections to many religions is the super-powerful beings who get a free pass on the same rules of morality and justice that mere mortals have to follow. For instance, if I had the ability to turn people to salt, and I did it to Lot's wife because she looked at something that displeased me, I would be a murderer. It's all cool when God does it, though. My point is, Quasar fighting entities who claim carte blanche to do what they want because they have power is more likely to enhance, rather than detract, from an atheist outlook. As DC Comics Executive Vice President and Publisher Paul Levitz has pointed out, "The original creators of comics, 60 or 70 years ago, were almost all Jewish and Italian kids from various parts of New York [and] the characters they created were pseudo-whitebread Episcopalian. It was almost de rigueur back then to paint people in this idealized American image." With the Episcopalian American WASP as the de facto character template for super-heroes when the genre began, it is not surprising that so many popular super-heroes seem Episcopalian. Despite earlier strong taboos preventing overt portrayals of great super-heroes have become identifiable as Episcopalian or Anglican. 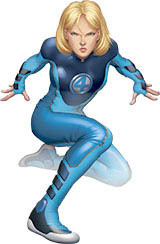 There are a wealth of characters to choose from, but our pick as the greatest Episcopalian super-hero is Susan Storm Richards, better known as "Invisible Woman," a founding member of the Fantastic Four. Sue Richards would have a place on any general list of great super-heroes. Moreover, as a founding member of the famous Fantastic Four, she literally helped herald in the Marvel Universe. She has remained an important fixture in Marvel comics, and is easily one of her world's most beloved super-heroines. In fact, she is something of a matriarch for the super-heroine community. Her influential husband Reed Richards has important male peers (such as Iron Man, Professor X, Spider-Man, Hulk, etc. ), but no woman quite matches the fame and cachet of Invisible Woman. Invisible Woman is also immensely powerful. She doesn't like to show off, but when she wants to be, she's a match for just about any super-powered opponent - friend or foe) on (or off) the planet. Few super-heroines have been greater role models than Sue. She is loyal, yet independent, intelligent without being arrogant, kind without being weak. She has been a wonderful mother, wife, and friend. Susan is the moral center of the Fantastic Four, the heart of her team, the anchor that has kept Reed Richards in line on countless occasions. What is less well known is that Susan is a truly spiritual, religious person. During Infinity Crusade the Goddess noted Susan's deeply-felt but often overlooked religious beliefs. Sue has recalled her upbringing with her brother Johnny, when they regularly attended Sunday School. Invisible Woman does not push her beliefs as an Episcopalian on others, but they are very important to her. Susan (along with her brother and husband) even had the opportunity to meet God when they journeyed to Heaven to retrieve their deceased teammate, Ben Grimm. Sue's religious affiliation was particularly evident in the second Fantastic Four movie, when she arranged for her Episcopalian pastor to perform her wedding ceremony. Unfortunately, the ceremony was interrupted. Later (after much adventure involving the Silver Surfer, Doctor Doom, and Galactus), the Fantastic Four found themselves in Japan. Sue and Reed decided to wait no further and get married there. But rather than using local wedding customs or having a civil ceremony, Sue arranged to have her pastor flown all the way to Japan to perform the ceremony. We don't know how often Susan Storm Richards takes her children, Franklin and Valeria, to church, but it is probably more often than most people realize. Runners-Up: There are many great Episcopalian/Anglican super-heroes to choose from. Some superhero historians regard the Scarecrow of Romney Marsh as the "first costumed super-hero" in the genre. This character's alter ego was an Anglican clergyman: Rev. Dr. Christopher Syn. Dan Dare (Pilot of the Future) is a prominent British comic book hero who was originally conceived as an Anglican clergyman, but was eventually portrayed as a laity. These are interesting examples of Episcopalian heroes, but they are too obscure to be chosen as the "greatest." Jamie Madrox (also known as the mutant Multiple Man) is probably an Episcopalian. One of his duplicates even studied in divinity school and became an Episcopalian clergyman. But the core Jamie Madrox himself is not a regular churchgoer and is certainly not as great or as influential as Invisible Woman. Jean Grey (also known as Marvel Girl and Phoenix) is an Episcopalian. Her brother was even an ordained Episcopalian minister. Although Jean Grey is easily as powerful as Invisible Woman, and probably as well known among comic book readers (but not her world's general public), Jean loses points for her many transformations into the evil Dark Phoenix. Hank McCoy (the Beast) and Psylocke are other examples of X-Men who are Episcopalian or Anglican. But their Episcopalian/Anglican religious affiliation is not well known (perhaps because Betsy and Hank wear far less clothing than most of their co-religionists). Captain Britain has never seemed like much more than a nominal Anglican. Perhaps the worst example of an Episcopalian super-hero is Batman: He may be an incredibly efficient hero and one of the most famous super-heroes ever, but he is very lapsed from the Episcopalian/Catholic religious faith that he was brought up in. I once read a story in which she tells her son Franklin (who is doing a class project on what his family does for Christmas) that every Christmas and Easter she goes to St Patrick's Cathedral in Manhattan, lights a candle and prays for her family, living and dead alike. As St Patrick's Cathedral is the premier church for the RC Archdiocese of New York, it stands to reason that she is indeed a Catholic. Her coyness about her faith may be due to a desire not to be"controversial" due to the Church's stance on things like abortion. As an Episcopalian, I will affirm that a number of us have attended Roman Catholic churches as well as Episcopalian. For example, my sister converted from Episcopalian to Roman Catholic when she married a Roman Catholic, and I attend Christmas and Easter services with her at her Roman Catholic church. There is nothing in the Episcopalian belief that forbids our doing so. Perhaps some of the Roman Catholic and Episcopalian clergy still hold grudges against the other's church, but most of us in the laiety recognize that our churches are far more alike than unalike. There are some good candidates to choose from, but our pick for "greatest Baptist super-hero" is Jefferson Pierce, who is better known as "Black Lightning." This character was one of the earliest important black super-heroes, and one of the first ever to star in his own title. Black Lightning was the model for the "Black Vulcan" character on the Super Friends TV series and he subsequently was featured in TV and animation in his own right. 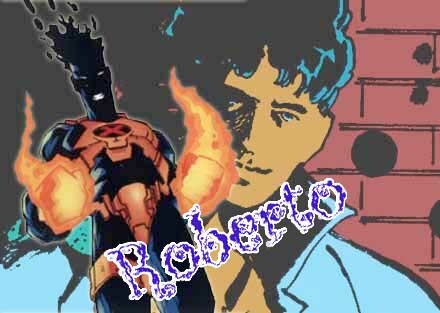 He was a long-standing member of the Outsiders and has become a core member of the Justice League of America. In his civilian identity, Jefferson Pierce even became the U.S. Secretary of Education under President Lex Luthor. Black Lightning is a truly great Baptist. He was created by Tony Isabella to be a devout Baptist, a member of one of America's most important historically black religious bodies, the American Baptist Churches USA (the so-called "Northern Baptist Convention"). Naturally enough, Black Lightning has never exhibited any of the racial or religious intolerance that often characterizes comic book characters associated with the Southern Baptist Convention. Since being written by Isabella, his Baptist religious affiliation has been portrayed less regularly, but there is nothing about the character to suggest he has ever converted to anything else. Black Lightning is a deeply moral person and a highly effective super-hero. Despite competition from some strong contenders, he is our pick for the "greatest Baptist super-hero." 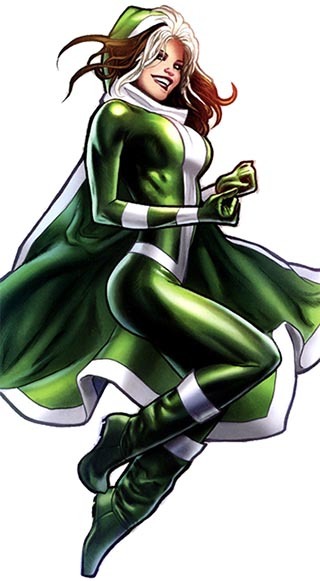 Runners-Up: One of the best known Baptist super-heroes is Rogue, who was raised in the Southern Baptist Convention. Rogue has become one of the greatest, best known X-Men ever, although she started out as a super-villain under the tutelage of her adoptive mother, the evil Mystique. There is something of a bifurcated nature to Rogue's religious portrayal. In the mainstream Marvel universe, Rogue is a highly principled woman in most ways, but it seems fairly certain that she is thoroughly lapsed from any active religious observance. In Ultimate X-Men, Rogue is portrayed as more devout and normative in her Baptist religious beliefs. A super-hero who is more active in his faith but less well known than Rogue is Sam Guthrie, the mutant known as Cannonball. Sam was introduced as a founding member of the New Mutants, and eventually "graduated" more senior teams X-Force and finally the X-Men. Sam has strong beliefs and values, perhaps even more so than his sister Paige (the mutant hero Husk). The Guthries (including super-powered siblings Melody and Jay) can be regarded as admirable Baptist super-heroes, but they simply aren't as important or as well known as Black Lightning or Rogue. Finally, we might mention the high-flying Falcon, one of the most important black super-heroes in the Marvel Universe. As side-kick to Captain America and subsequently an Avenger and S.H.I.E.L.D. agent in his own right, Sam Wilson is a great hero. Sam's father was a Baptist preacher. Although Sam's parents loved the Bible and were excellent examples of Baptist living, Sam himself refused to join their church at the age of 16. As far as we know, Sam Wilson remains a lapsed Baptist and as an adult has never joined any denomination or regularly attended any congregation. Buddhism, particularly the minority form known as Tibetan Buddhism, has been used frequently in pulp stories and genre fiction, including comics. Many super-heroes and adventurers have gained their wisdom, abilities, martial arts training, and/or super-powers by studying in Buddhist monasteries. These have usually been Caucasian Westerners. Not surprisingly, there are also many Asian super-heroes who have been portrayed as Buddhists. 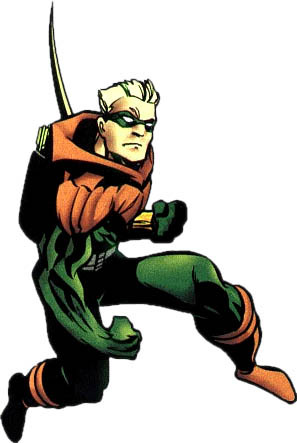 Thus, there are many candidates, but our pick for the greatest Buddhist super-hero is Connor Hawke, the second Green Arrow. Conner Hawke is an important character. During the time his father (Oliver Queen, the original Green Arrow) was dead, Conner ably took over his father's mantle. Conner became a member of Justice League of America and remained an important character in the DC Universe even after his father returned. Conner Hawke was also a devout Buddhist. He was raised in an American-based monastery and even became a monk. After leaving the monastery and becoming a costumed super-hero, Conner's religion remained central to his identity. This gentle, devout Buddhist often spoke of his religion and never failed to act in accordance with his deeply felt beliefs. Many other super-heroes have studied in monasteries and have become Buddhists, but we have picked Conner Hawke over them because of the degree to which he displayed continued devotion to his religion. Also, Conner's abilities as a super-hero were not derived from his religion. It is true he trained in martial arts and archery while at the monastery, but after leaving the monastery, he could have ignored the religious part of his upbringing. Onyx, for example, is a heroine who trained at the same monastery as Conner, but after leaving she never paid much attention to Buddhism at all. Conner remained a devoted Buddhist purely by choice. Runners-Up: There are far too many Buddhist super-heroes to mention here. Even a number of notable early costumed heroes were Buddhists, including Lamont Cranston, a.k.a. The Shadow. Cranston, featured in radio, TV, film, comics and prose novels was a precursor of many subsequent Western adventurers who gained amazing abilities and/or powers while studying in Tibetan monasteries. But as The Shadow, Cranston rarely mentioned Buddhism. He was similar in this regard to other heroes, such as Thunderbolt (Peter Cannon), Wonder Man (Fred Carson), Mandrake the Magician and Kaliman. Iron Fist fits this pattern in some ways, although he seems more religious in his heroic career than these others. The Green Lama (Jethro Dumont) was an exception to this pattern, in that he not only maintained Buddhism as a visibly prominent part of his life after training, he was even an ordained Buddhist monk (or "lama"). The Green Lama might have been a contender for the title of greatest Buddhist superhero if here were not so obscure today. Iron Fist is also a strong runner-up. He is relatively well-known, having starred in many issues of his self-titled series co-starred in Power Man and Iron Fist, and is now featured New Avengers. Iron Fist talks about his religion far less than Conner Hawke, however, and his connection to Buddhism is less clear. While Hawke clearly identifies himself as a Buddhist, Iron Fist rarely uses this "B" word and often is connected to a fictional form of K'un Lun mysticism which is recognizably a form of Tibetan Buddhism, but not overtly identified as such. A number of Asian Buddhist super-heroes could be considered as well. The late Thunderlord (Liang Xih-k'ai) of the Global Guardians was a very devout Chinese Buddhist. Sailor Venus (a friend of Sailor Moon) is a particularly devout Buddhist super-heroine, but she loses points for being relatively obscure outside of manga and anime circles. Thundermind of the Chinese national super team The Great Ten is even an actual Bodhisattva (i.e., an "enlightened being" or a Buddhist deity). Xorn of the X-Men was also a Chinese Buddhist, although his history as a hero is tarnished by villainy and mixed up with Magneto masquerading him. A reformed villain who has become a rather noble super-hero is Dr. Chen Lu, a.k.a. Radioactive Man of the Thunderbolts. He is quietly Buddhist, although not as devout as some others. Given the number of genuine, practicing Buddhists, one need not consider lapsed or non-practicing Buddhists such as Shockwave (Katy Ling) of the New Universe team Psi-Force or Swift (Shen Li-men) of Stormwatch and the Authority. Lutheran super-heroes are hard to come by. For whatever reason, Lutherans just don't get much play in the world of comics. Our pick for the greatest Lutheran super-hero may not be as strong as the picks for other groups, but he seems to be the best we can come up with: Jimmy Olsen. Now, we'll be the first to admit that there are few problems with this pick. For one, he's not really a super-hero - he's a supporting character. In fact, "Superman's pal" is one of the best known supporting characters in super-hero history. 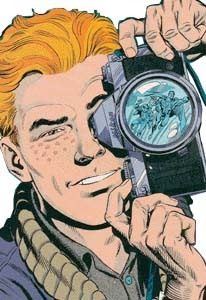 As a photographer for the Daily Planet, Jimmy Olsen has often portrayed as the best friend of both Clark Kent and Superman. Also, Jimmy Olsen may not be overtly Lutheran. Sure, influential Superman scribe Elliot S! Maggin said that Jimmy is a Lutheran, and the character's name is Olsen, after all. He seems like a person with a Lutheran background, but as for on-panel identification, we're not sure there's anything to point to. Finally, it's true that Jimmy has never been portrayed as a particularly religious character. He's not a bad guy at all. But he was borne in an era where the religious taboo was strong and overt portrayal of religious identification was verboten. On the plus side, Jimmy Olsen is one of the greatest characters, best known characters in comicdom. People in the general public who have never heard of "Charles Xavier" or "Cat Grant" or "Donna Troy" can probably tell you who Jimmy Olsen is. 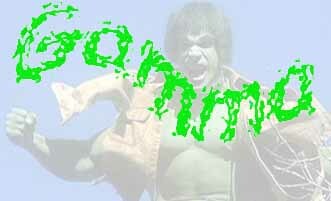 Jimmy has been featured in more live action TV shows, movies, and animated cartoons than just about anybody. So he's pretty great. And he really is a superhero! Just not all the time. Jimmy Olsen has had more super-powers than most super-heroes have had issues. Starting in 1954, Jimmy Olsen was the star of his own series, Superman's Pal, Jimmy Olsen, which ran for 163 issues! In many of these stories, as well as in many stories in Superman, Action and other series, Jimmy Olsen had powers and behaved like any other super-hero. 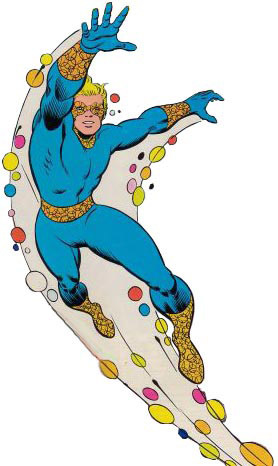 His longest-running superheroic identity was Elastic-Lad. He was even an honorary member of the Legion of Super-Heroes! In recent continuity Jimmy Olsen has usually been strictly a supporting character. But as recently as 2007 he gained powers once again and donned a colorful costume as "Mister Action." Runners-Up: There are not a lot of Lutheran super-heroes to choose from. Reflex (Walter Thorsson) of the short-lived Chris Claremont series Sovereign Seven was overtly Lutheran. But who has heard of him? Perhaps slightly better known is Mastodon (Dave Landers), who was officially identified as somebody who was raised Lutheran but as an adult was an atheist. There's also Little Mermaid (Ulla Paske of DC's Global Guardians). One could assume she's a nominal Lutheran because at the time she was created nearly all people in Denmark were Lutheran. (95% of Danish citizens were officially members of the Lutheran Church in 1977). But "Little Mermaid" is also half-Atlantean, was probably never an active churchgoer, and her name causes people to think of a Disney movie rather than a super-hero, so she was never a serious contender. When it comes to religion, Latter-day Saints (or "Mormons") outnumber Jews in the United States (according to the 2007 survey of 35,000 people by the Pew Forum on Religion and Public Life, based in Washington, D.C.). Yet there have been literally hundreds of Jewish super-heroes in published comics, but only a handful of Latter-day Saints - even fewer if one considers only super-heroes overtly identified by name as Latter-day Saints. From this relative paucity, we have selected Tom Evans (the Canadian counterpart to Captain America) as the greatest Latter-day Saint superhero. Captain Canuck is a relatively prominent super-hero (at least compared to other Latter-day Saint superheroes). 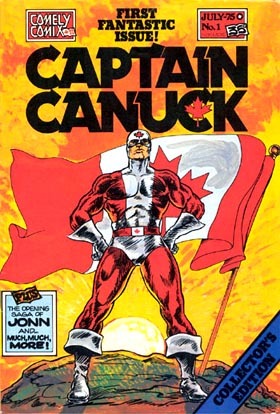 Captain Canuck was genuinely written as a Latter-day Saint by his creator and principle chronicler. Plus, he always displayed devotion to his beliefs and a strong moral center that Latter-day Saint readers can be proud of. Captain Canuck is not as well known as some mainstays of Marvel and DC comics (a la Superman, Batman, Spider-Man, et al), but he is universally known among Canadian comic book fans. Captain Canuck was even honored on a Canadian postage stamp. Captain Canuck easily ranks in the top 2 or 3 most famous Canadian superheroes of all time, and he is well known and respected among comic book fans with interests in classic independent (non-Marvel/non-DC) superhero characters. But one knock against Captain Canuck's "greatest" status is the fact that he is NOT part of the two best known comic book universes: Marvel and DC. Another problem with Captain Canuck is the fact that it isn't clear that he was ever overtly identified by name as a Latter-day Saint in published comics. Captain Canuck was the creation of a devout Latter-day Saint comic book writer - Richard Comely. Captain Canuck says Latter-day Saint-style prayers in published comics and does and says a number of things which clearly hint at his religious affiliation. Among careful readers, there is no real question about what Captain Canuck's religion is and that he was a sincere, devout member, but because it wasn't mentioned by name, this fact is unknown by many. But Captain Canuck is a Latter-day Saint and, moreover, he is a truly great super-hero. He represented Canada before there was Alpha Flight or other modern Canadian national heroes and he embodied Canadian ideals and philosophies more than most super-heroes who just happen to be Canadian. (Wolverine, for example, hardly represents Canadian values and ideals). Canadians, tolerant by nature, never seemed to mind that they were represented in superherodom by a member of a denomination that may be very prominent in Alberta but is a small minority in most of their nation. Runners-Up: A number of Latter-day Saint superheroes have serious drawbacks that limit their consideration as the "greatest" superhero representing their faith. The biggest problems are that the characters are either too obscure or their status as Latter-day Saints is too tenuous. Some obscure characters are clearly and overtly Latter-day Saints, but they are hardly "great" superheroes in the greater scheme of things. Among these are Straight Arrow (a.k.a. Nephi Callendar, who appeared only in Wild Cards novels), Joseph Smith of the Super Best Friends (an ice-powered super-hero who appeared in episodes of South Park, Dr. Deseret (who appeared only in the short-lived Captain Confederacy comic book series published by Marvel's Epic line), Orgazmo (a.k.a. who appeared only in one feature film by South Park creator Trey Parker) and Utah's Initiative team, identified as LDS by S.H.I.E.L.D. deputy directory Maria Hill in the pages of Marvel's Civil War series. Although these characters are overtly identified as devout Latter-day Saints, they are all very obscure. Marvel's most prominent character who was identified by name as a Latter-day Saint is police detective Jacob Raven, who appeared in many Spider-Man comics and once arrested Peter Parker for murder. Jacob Raven is a great character and a great Latter-day Saint, but he is NOT a super-hero, so we must throw him out of the running. A number of genuine costumed super-heroes are more prominent, but they have not been identified by name as Latter-day Saints, and may have only accidentally been identifiable as such. Among these are: Power Pack (Marvel's team of four pre-teen heroes), Cypher (Doug Ramsey of the New Mutants), Mary Marvel (a.k.a. Mary Batson of the Marvel Family, originally published by Fawcett and now a DC Comics star) and the Wonder Twins (Zan and Jayna, originally stars of the animated Super Friends TV series and later featured in published DC comics. One can debate the "LDS status" of a number of these. The Wonder Twins were, for example, based on real-life Latter-day Saints Donny and Marie Osmond. But as natives of the planet Exor, the Wonder Twins were probably not intended to actually be Latter-day Saint characters. Doug Ramsey in Marvel's Ultimate universe was based on real-life Latter-day Saint Ken Jennings and a good case can be made that even the original New Mutants version of the character was a Latter-day Saint. But he has never been overtly recognized as such. Given their extreme cases of either obscurity or tenuousness with regards to religious affiliation, none of these other Latter-day Saint super-heroes really come close to Captain Canuck for the title of "greatest Mormon super-hero." If we had to pick one we might pick Doug Ramsey. He was a really, really nice guy and he certainly seemed Mormon, but his mutant power to translate languages was not very helpful in combat. Sadly, mainstream Marvel's Doug Ramsey died when he leaped in front of an assassin's bullet while trying to protect Rahne Sinclair. I think this is really good analysis. It would be nice if there were more prominent LDS super-heroes, but given what is available, Cap. Canuck is probably the best pick. The thing I find most interesting is that the religion is even included on the list. Given what few clear examples there are, I think it's commendable that the LDS church is given this amount of attention in the first place. So why don't we see more overtly LDS superheroes? Webpage created 28 February 2008. Last modified 5 February 2008.